SOUTHINGTON - Members of the health community met last week to discuss the rising cost of prescription drugs. 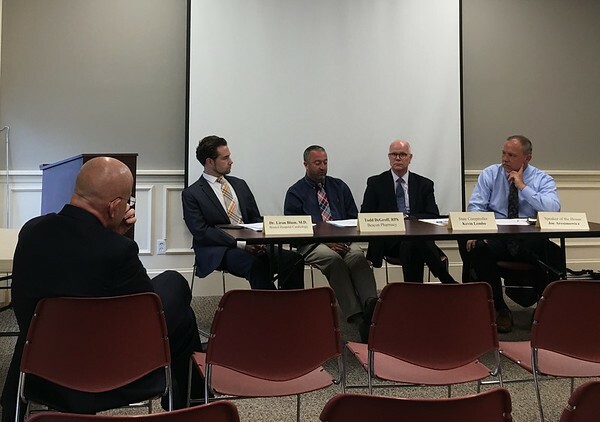 Connecticut House Speaker Joe Aresimowicz, D-Berlin, hosted a forum on the topic at the Southington YMCA, with state Comptroller Kevin Lembo, pharmacy owner Todd DeGroff, and Dr. Liran Blum of Bristol Hospital taking part in the panel discussion. “Prescription drugs are going absolutely through the roof,” Aresimowicz said to start the forum. Lembo, whose office oversees the health benefits programs of all state employees, began by talking about customers getting duped into using compounding medications that aren’t typically used, but are advertised and sold directly to them. The customers will accept any resolution to address their pain, he said, and will end up getting charged $1,000 to $3,000 for a tube of ointment in some cases. DeGroff, the owner of Beacon Pharmacy in New Britain, spoke about how his business works with the control over drug prices for non-insured patients. He said his business does individual packaging for customers and doesn’t have control over co-payment costs. The practice of pharmacy benefit managers who negotiate a drug price between pharmaceutical companies and pharmacies, but then claw back some of their funds from the pharmacies, was criticized by DeGroff. Although as a cardiologist he is not exactly a preventative physician, Blum said, he does have to prescribe medication to patients, which most of the time comes in the form of an expensive name brand, not a cheaper generic form. He noted that large pharmaceutical companies that are supposed to support research and development of generic forms of name-brand medicines rarely do so. He said research and development is only 10 to 20 percent of a pharmaceutical company’s business. The rest goes toward marketing and advertising, he said. “Oftentimes the physician is not aware of how much these medications cost because they are not involved in that process,” said Blum, adding that health-care delivery is very fragmented. DeGroff later added that customers will often hit their deductible before they expected because they weren’t aware of how costly the brand name drugs can be. The Pharmaceutical Industry is probably the highest-spending lobbying group at the state level, Aresimowicz said, before Lembo brought up House Bill 5384 that recently passed both chambers and provides more transparency on prescription costs. Trying to make rebates that are negotiated with pharmaceutical benefit managers more reflective in consumer costs, and strengthening the bill, were other things Lembo discussed. One audience member asked about the reality of purchasing for the entire state as a way to cut down on pharmaceutical costs. Lembo said a larger purchaser can attain savings but only to a certain point, and that a hub to purchase certain drugs from one company and other drugs from another company should be created. Other topics discussed included direct drug sales to consumers and the merger of CVS and Aetna. Posted in New Britain Herald, Berlin, New Britain, Southington Herald on Monday, 13 August 2018 21:22. Updated: Monday, 13 August 2018 21:24.